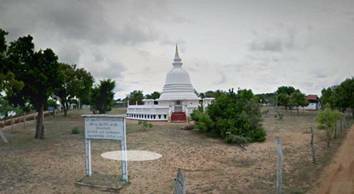 On August 23, 2016 the Northern Provincial Council (NPC) passed a resolution during the 56th sitting unanimously condemning the building of a Buddhist vihara by Sri Lankan troops on land belonging to a Hindu temple in Kilinochchi. The resolution was moved by NPC member Subramaniam Pasupathipillai. Tamil National Alliance parliamentarian Sivagnanam Sritharan visited the area recently, which has barbed wire fences around its perimeter. The Tamil National People’s Front’s Selvarajah Kajendran also commented on the development, stating that the move was “unacceptable”. Northern Provincial Council Chairman C.V.K. Sivagnanam has forwarded the said resolution to President Maithripala Sirisena and Prime Minister Ranil Wickremesinghe. In his letter to the President and Prime Minister the Chairman of NPC explained that the construction of the Buddhist temple is on a 4.5 acres of land belonging to Kilinochchi Kanagambikai Amman temple administration board, but presently occupied by the armed forces. “This is a public encroachment of temple property and it is completely against the religious and national reconciliation. He also pointed out that this is a public encroachment of the temple property and it is against the religious and national reconciliation striving to be achieved by the government. Hence the NPC requests His Excellency President and Hon. Prime Minister to take appropriate actions to stop the construction of the Buddhist temple and to hand over the land belonging to Kanagambikai temple to temple administration board. On November 26, 2015 during the reign of President Mahinda Rajapaksa a newly constructed ‘Ata Visi Buddha Mandiraya’ at the 24 Gemunu Watch (GW) Headquarters under the Security Force Headquarters – Kilinochchi (SFHQ-KLN) was opened by the army. Major General Amal Karunasekara, Commander, SFHQ-KLN placed the Buddha Statues at the ‘Ata Visi Buddha Mandiraya’ and conducted religious observances by consecrating the peace. Senior Officers and other ranks also attended the ceremony. 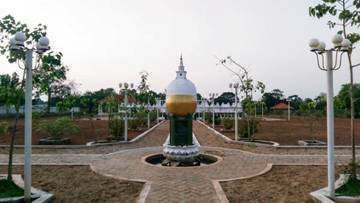 Troops from the Sri Lankan military orchestrated a religious ceremony and placed 28 Buddha statues in the newly constructed Buddhist vihara building in Kilinochchi. Buddhist monks attended the ceremony and blessed the newly constructed ‘Ata Visi Buddha Mandiraya’ at the Sri Lankan Security Force Headquarters. Senior military officers and other ranks also attend the ceremony. Apparently, the armed forces consider the Northeast provinces as occupied territory, similar to Israeli occupied Palestinian (the West Bank including East Jerusalem and the Gaza Strip) territory. This is not the first instance where Buddhist viharas/statues have been erected by the Sri Lankan armed forces occupying the Northeast, but the pace and intensity has escalated since the defeat of the LTTE in May, 2009. It is part of the long-term conspiracy in the continued Sinhalization and Buddhistization of the Northeast since independence. The master-mind was Prime Minister D.S. Senanayake who under the guise of settling landless Sinhalese peasants launched massive colonization schemes like Gal Oya, Allai, and Kanthalai in the east. His successors opened up similar colonization schemes like Mudalikkulam (renamed Morawewa), Nochchikulam (re-named Nochiyagama), Periya Vilankulam (renamed Mahadielwewa) etc. The colonisation scheme was extended into the Northern province with the launching of the Manal Aru (renamed Weli Oya) colonization scheme by the Mahaweli Development Board in 1984. Though Manal Aru covered the districts of Mullaitivu, Trincomalee, Vavuniya and Anuradhapura administration was handled from the Sinhalese dominated Anuradhapura district. A total of 13,288 Tamil families living in 42 villages for generations including Kokkulai Grama Sevakar Division (1516 Tamil families), Kokku –Thoduvai Grama Sevakar Division (3306 Tamil families), Vavuniya North Grama Sevakar Division (1342 Tamil families) and other Divisions of Mullaitivu District including Naiyaru and Kumulamunai (2011 Tamil families) were asked to vacate their homes and farmlands within 48 hours, on pain of eviction by force in case of default. This threat was issued by the army over the public address system. Simultaneously, land given to 14 Thamil entrepreneurs, including Kent Farm and Dollar Farm, on 99 years lease was also cancelled and taken over by the government under a gazette notification. Settlements in the Weli Oya began in 1984 as a dry zone farmer colony under the land Commission, but it was later acquired by the Mahaveli Economic Agency in 1988 and declared as the Mahaveli ‘L’ zone. In fact colonization of Manal Aru colonization scheme commenced as early as 1984 and the Sinhalese army’s presence in the area dates back from the same year. The Sinhalese army did use force as promised and scores of Thamil villagers, some of them Hill country Thamil refugees, victims of earlier Sinhalese violence in 1983, were murdered and the rest fled in terror. The successive governments have used or abused the armed forces as an instrument of state terror against the Thamil people. This is true even today and the bulk of the army is deployed in the Northeast. Out of 20 army divisions, 14 of them (Jaffna – 51,52,53, Kilinochchi – 57,64,66, Mullaitheevu -59,64,68 and Vavuniya – 21,54, 56,61,62) are in the north and 3 (22,23, 30) in the eastern province. The highly politicised army is resisting release of thousands of acres of private lands owned by Thamils but falling within High Security Zones (HSZs) established by the army. In 2014, after completion of Sinhalese colonization, Manal Aru area was re-attached to Mullaitheevu district. During the presidential election campaign in 2014, Mahinda Rajapaksa handed over title deeds to the land to 3,000 Sinhalese families at a ceremony held in Kilinochchi. A separate Sinhalese AGA division has been created for the area. Since May, 2009 viharas/ statues have mushroomed in the Northeast, especially the north where there is heavy army presence. Here is a short list of districts where the army/navy has constructed Buddhist temples/statues though hardly there are Buddhist worshippers. The list is by no means complete. 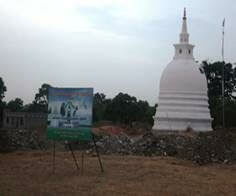 (1) At Kanagarayankulam in Kilinochchi district a Buddha statue and a Stupa have been erected. 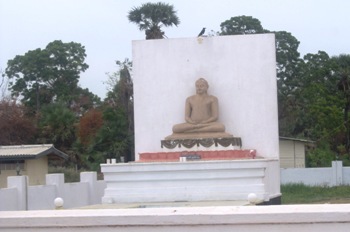 (2) At Mankulam in Vavuniya district a Buddhist vihara has been built. Electricity has been provided to this elaborate structure. 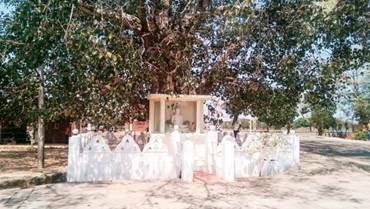 (3) At Iranaimadu in Mullaitheevu district a sculpture of a meditating Buddha has been installed under a peepul (Bo) tree. 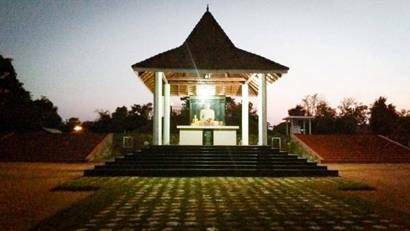 (4) A Buddhist vihara has been constructed at Vadduvaakal in the Mullaitheevu district. (5) A huge Buddhist vihara is under construction in Kokkulai in Mullaitheevu district after destroying the Hindu temple Karunaaddu Pillayar. 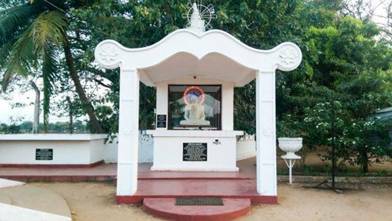 (6) A Buddhist vihara named Mahatota Raja Maha Vihara has come up within 50 meters of the famous Thirukethiswaram temple in Mannar district. The ancient name for Thirukethiswaram area was Mahathottam. The army planted a 1500 kilo metal Buddha statue on the shores of Palavi Theertham in the ancient temple. The fear is Thirukethiswaram may be converted to a Buddhist temple like Kathirkamam temple in the south. Kathirkamam temple, the 2,500 years old Hindu shrine is now in the hands of Sinhalese. The Ohm sign above the entrance to the shrine has been removed. Those interested in projecting Kataragama as a Buddhist centre have capitalised on the colourful festival procession by introducing Buddhist rituals into it. On the day before the water-cutting ceremony, Lord Murugan goes to Kiri vihare to the Buddhists. Now, a `relic` is taken ceremoniously from the Buddhist temple (formerly Perumal Hindu Temple), to the Murugan temple, and then placed on a caparisoned elephant and made to lead the procession. Lord Murugan no more understands Thamil! Sadly, but not surprisingly the Governor of the Northern province has strongly defended the building of Buddhist temples in the province saying that it is only part of a boom in the building of places of worship there. 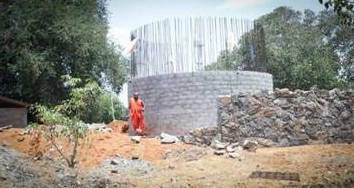 “Big Hindu kovils are being built and many Christian denominations have come up with their buildings. But there are only 13 Buddhist temples in the entire Northern Province, we don’t object to the Hindu kovils and Christian churches coming up. We welcome them, I wonder why some should object if the Buddhists built their viharas” was his answer to a question put to him by a reporter at a press conference held in Colombo on 16th August, 2016. The reporter queried him why a Buddhist temple is being built on a person’s private property at Kokkulai in Mullaitivu district. A subject that has created tension among the local population. Defending his stand, the Governor went on to say that the Buddhist temple had secured the permission of the local Pradesha Sabha and in a case against it; the court had upheld the construction. It also has the support of hundreds of Sinhalese families living there. The Thamils see the construction of Buddhist temples as an extension of Sinhalese-Buddhist hegemony in the North after the defeat of the Liberation Tigers of Thamil Eelam (LTTE). Thamils wonder why Buddhist temples are being built and Buddha’s statutes are erected in areas where there are no Buddhist worshippers. What is more irritating is the fact most of them are constructed by the armed forces. The message is just a reminder telling the Thamils they are under the Sinhala – Buddhist regime run by colonial governors. They are second class citizens with inferior status compared to Sinhalese. The Governor added insult to injury by claiming “if Hindu temples can be built in the south, why not Buddhist viharas in the Northern Province.” No doubt he is comparing oranges with apples. If any Hindu temple is built in the south, it is on land purchased by the Hindus and cost of construction borne by them. This is a far cry from what is happening in the Northeast where Buddhist viharas are constructed by the army/navy out of public funds on lands mostly owned by Thamil citizens. Unlike viharas which are built in places where there are no Buddhist worshippers (the only Buddhists are the Sinhalese soldiers stationed in the Northeast) the Hindu temples, if any, is not built where there are no Hindus! There is no doubt the Governor is wittingly fanning the flames of communalism and religious fanaticism by drawing a parallel between the Buddhist viharas in the north and Hindu temples in the south. In the process he gave ammunition to those extremists on the Thamil side to fire at the moderate TNA leadership by confirming their oft repeated charge that Sinhalese cannot be trusted! That Sirisena is another Rajapaksa and the difference between them is only in name. That Sinhala Buddhist nationalism is similar to the German nationalism of 1940s. Thamil extremists never fail to cite historical incidents to back their claims. In 1920 Sinhalese leaders James Peiris, president of the Ceylon National Association and E J Samarawickreme, president of the Ceylon Reform League repudiated the written agreement to nominate Sir Ponnambalam Arunachalam to the Colombo seat. D.S. Senanayake who reneged on his solemn promise to the Thamil and other minority communities “no harm need you (non-Sinhalese) fear at our hands (Sinhalese) in a free Lanka.” He was speaking in the State Council in October 1945 when all the Thamil members had unanimously voted for the acceptance of the Soulbury constitution in a White Paper. Later, the tearing of the B-C pact singed on 26 July, 1957, the abandonment of the D-C pact signed on 23, March 1965 in 1968 etc. They confidently predict the Thamils will once again be taken down the garden path when the new constitution now in making is finally adopted. What is more, your pronouncements are sharply at variance with the policies of President Sirisena and Prime Minister Ranil Wickremesinghe who are striving hard to bring about reconciliation between the Sinhalese and the Thamils. The present government wants to reverse the chauvinistic polices followed by the previous regime under Mahinda Rajapaksa. In fact, you are in good company with Sinhalese hawks like Wimal Weerawansa, Uthaya Gammanpila, Nishantha Sri Warnasisnghe and some others who pose as Sinhalese nationalists. Addressing a news conference at the JHU headquarters at Battaramulla, Propaganda Secretary Nishantha Sri Wanasinghe asked why Thamil politicians in the north are vehemently opposing the construction of temples and Buddha statues in the north. He said, Hindu temples had been built in all parts of the country and no one in the South had opposed them. He further asked why some Thamil politicians were averse to Buddhist temples and statues being built in the north. He claimed that according to the Constitution every citizen had a right to live in any part of the country and practice of his or her religion. Warnasinghe was of the opinion that some northern politicians were behaving like tribal leaders. He said the JHU was confident that their separatist agenda would never be successful and their dream of a federal state would never be a reality. The argument that according to the Constitution every citizen had a right to live in any part of the country and practice of his or her religion is fine in theory. But, in practice it is a cloak to colonize the northeast with Sinhalese at state expense. There is no history of Thamils getting settled by the successive governments in the south. Those Thamils driven out by the Sinhalese hoodlums during the riots of 1958, 1977, 1979, 1981 and 1983 have not got their land and properties back. Or any compensation paid. This tall claim that every citizen had a right to live in any part of the country is typical tongue in cheek talk by most Sinhalese politicians in the south. If all are free to practice of his or her religion why is the army/navy constructing viharas and erecting Buddha statues in the Northeast only? Why the constitution (Article 9) gives foremost place to Buddhism and duty of protection by the State? To protect and foster the Buddha Sasana? This provision which nullifies equality of citizens is an obstacle to the government’s reconciliation efforts. The Northeast remains under the jackboot of the armed forces (18 Divisions out of a total of 22) 7 years after the war. .
Refreshingly, not everyone agrees with Governor Reginald Cooray’s Sinhalese majoritarian and supremacist views. Government Spokesman and Minister of Health Rajitha Senaratne has stated building Buddhist temples, placing Buddha statues under Bo-trees and at junctions by the security forces after defeating the LTTE in the North-East had not done any good other than to negate the government’s reconciliation efforts. “On several occasions, I spoke to President Mahinda Rajapaksa on this matter. He accepted the negative impact of these actions but said it was not possible to stop armed forces personnel from doing so,” he said. The Minister added that though places of religious observances had been erected at every opportunity, there were no Buddhist devotees to maintain them resulting in these places being abandoned. As the saying goes ‘render to Caesar the things that are Caesar’s, and to God the things that are God’s, Governor Reginald Cooray should refrain from making explosive statements that negate reconciliation efforts by the government. As the executive Governor of the Northern province, he should concentrate to the economic, educational and social development of the war devastated province. Thousands of IDPs are still awaiting re-settlement in their lands though the war ended 7 years ago. In Valikamam North only 1,934.3 (30%) acres of land had been released so far. The balance 4,447.2 acres (70%) of land has yet to be released. A total of 3,260 Valikamam North IDPs consisting of 936 families are still living in 32 welfare centres. Also 79,000 war widows and 12,000 ex LTTE cadres are crying for sustainable economic development, livelihoods and job opportunities. Building more viharas and statues in the Northeast will worsen the long-simmering ethnic conflict between the Sinhalese and the Thamils and negate reconciliation efforts. This is the reality. Though the LTTE has been defeated, the causes that led to the bloody conflict remain unresolved. Instead of stationing troops in their thousands in the Northeast, the government should win the hearts and minds of the Thamil people. It is a fallacy to think national security could be achieved primarily through military might. One nation can or should try to dominate another nation. No power arrangement that elevates one nation or group of people over another will succeed. Posted September 9th, 2016 . Filed under Military, Politics, Religion.